Bach’s Suites á Violoncello Solo senza Basso are thought to have been composed during 1717-1723, when Bach served as Kapellmeister in Köthen. Although no manuscript in Bach’s own hand has survived, there is a manuscript in the hand of Bach’s second wife Anna Magdalena Bach. This is the historical source from which this arrangement has been made. 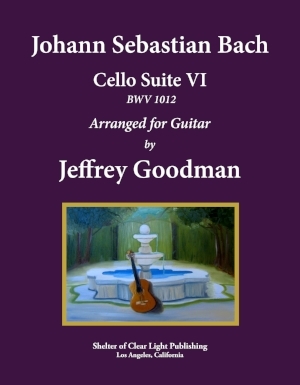 Cello Suite VI, BWV 1012, is in the key of D major, and this arrangement keeps the original key. I have also decided to arrange each of the movements using a low D tuning of the 6th string. This adds a rich sonority, and by extending the bass range, allows for a more authentic rendering of melodic lines, and also preserves much of the original voicing of chords. All of the music is richly notated with guitar fingerings and positions. Although there is no one way to play or finger this music, players can use this edition as a launching point for their own fingerings and interpretations.